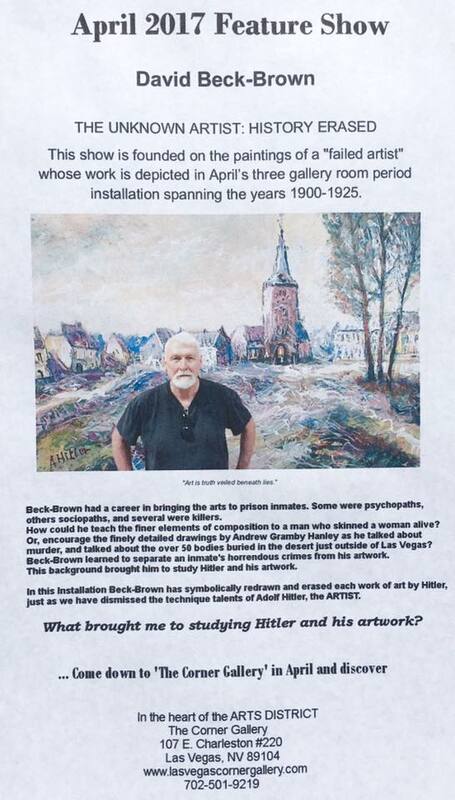 My art installation-exhibition entitled: ADOLF HITLER, THE UNKNOWN ARTIST: HISTORY ERASED, (1900-1925), hosted at the Corner Gallery in Las Vegas, Nevada, was well received. This 11 (+) minute film documents the response of people to the artwork. The video neither features my art installation, nor the manner the neoclassical furnishings are to be designed and composed with the two-dimensional images. It emphasizes the audience. This dress rehearsal reveals there were no negative reactions to the images attributed to Adolf Hitler, the artist. This may rest possible fears of it being perceived as a political statement. It is about art. This documentation is placed on YouTube for greater exposure. My intension is to secure a large cavernous space, possibly an art museum, to showcase the completed installation. The installation in its entirety incorporates raised platforms leaning against the walls at various angles. This symbolizes the social instability during which Hitler painted. It was during the clash of civilization, when traditional neoclassical art slammed head onto the new, contemporary art of its day. These platforms are used to support antique furniture, further establishing the historic time period in which Hitler created the images. The furniture includes a 1925 baby grand piano, as well as several neoclassical furniture enhanced with hand carved surfaces. This work, in its entirety, will utilize the open space with white linen draped over furniture as a symbol of departure. The linen will serve as screens for the projected architectural images designed by Albert Speer for Hitler's grandiose dream of a new Germania. The architecture drawings are original works under Speer's over site. This art installation-exhibition features the work of a little known artist. Acknowledging the rise of religious and racial tensions, my artist statement must be clear as to my motivation, and ironclad as to my intent. It has no political agenda. (A) I taught the fine arts to prison inmates. With this long career, I unintentionally entered a dark place in the lives of others, a place that became familiar to me. Many inmates are incarcerated for committing benign crimes; others are imprisoned for their heinous acts of murder and torture. I worked with both. I separate the art student from the criminal. One talented artist with whom I worked (on a one-to-one bases) had skinned a woman alive. Another gifted artist, Andrew Gramby Hanley (he used his real name), spoke of fifty shallow graves located in the Nevada desert just outside of Les Vegas. He knew where the bodies were buried. My job was to instruct the inmates on the finer qualities of the visual arts (i.e.) composition, color contrast, the power of a simple line, whether thick or thin, as well as the other elements of art. (B) No matter the gravity of his crimes, Adolf Hitler was a technically accomplished artist. My interest in Hitler developed through family history. General Ludwig Beck, a relative of mine, served under Hitler as the Chief of the German General Staff. According to family oral history, after the failed assassination attempt on the Fuehrer (20, July, 1944) known as Valkyrie, General Beck (known as the anti-Nazi General) as well as other relatives were executed down to Beck's third cousins. (A) Adolf Hitler painted during a clash of civilization, at a time when the traditional-neoclassical arts slammed head-on with the new, modern-contemporary art of his day. He disdained the new art as DEGENERATE ART. For Hitler, the radical new art lacked traditional principles, aesthetics, and artistic discipline, in contrast to the traditional art and its revered craftsmanship. The time period portrayed in this art exhibition spans from 1900-1925. "Warum versuchen mich laufend umzubringen? Ich bin doch nur Maler!" I AM CERTAINLY ONLY A PAINTER. Hitler created more than 3,000 paintings and drawings. After the war, many of his paintings were burned and destroyed. The Allied Forces looted over 1,000 of his best paintings to assure they would never be publicly exhibited. Many of Hitler's paintings were no larger than tourist postcards. One miniature scene of a sailboat crossing an Alpine lake, was smaller than an American quarter. To distinguish Hitler, the ARTIST, from Hitler, the FUEHRER, the paintings in this exhibit have been enlarged to the size of 3 x 4 feet. One work has been enlarged to 5 x 8 feet. With the paintings enlarged, the viewer may better appreciate his attention to detail. (B) Because of his political deeds as a dictator, historians and art critics alike, portray Adolf Hitler as a FAILED ARTIST. This exhibition offers an alternative perspective. No matter what extent we try to erase his artistic accomplishments, his paintings may be telling us another story, if only we were to listen. There are no failed artists.